Spring is in full swing here in New Jersey, and as much as we might enjoy the return of warm weather and blooming flowers, we’re not so fond of all the rainfall that often accompanies springtime. Thanks to those famous April showers, spring tends to be one of the dampest times of year. If your home isn’t properly protected against moisture intrusions, this can be a dangerous time for mold and mildew growth as well. By taking a few simple precautions, however, you can minimize the risk of mold growth this season. Let’s start with your drainage system. If you haven’t already, pick a day to clear any debris out of your gutters to prevent clogs. 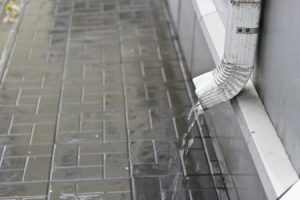 Make sure downspouts are firmly secured to gutters and that they drain well away from the foundation of your home. Take a walk around your house and keep a close eye out for puddles of water around your foundation. If you notice any places where yard debris has been washed up against the foundation in a storm, this can be a sign of poor drainage as well. In some cases, you may need to dig a shallow channel to allow water to drain away from your house. In others, you may simply need to extend or adjust the angle of your downspouts. You can kill two birds with one stone here. Take an afternoon to do a little spring cleaning and decluttering in the basement, and keep an eye out for signs of moisture while you’re at it. Water-stained cardboard boxes, for example, are a dead giveaway of moisture intrusions. Wet, weeping walls are another sign of trouble. If you do notice moisture accumulation in your basement, it might be wise to invest in a dehumidifier unit. As the weather warms up, you may start to notice the occasional musty smell when you enter your home. Pay attention to these smells, as they can lead you to places where moisture is accumulating. Places like bathrooms and laundry rooms are often the most prone to moisture buildup. If you’re concerned about mold and mildew growth in your home, don’t wait for it to get worse. Give us a call today for a free mold remediation estimate!